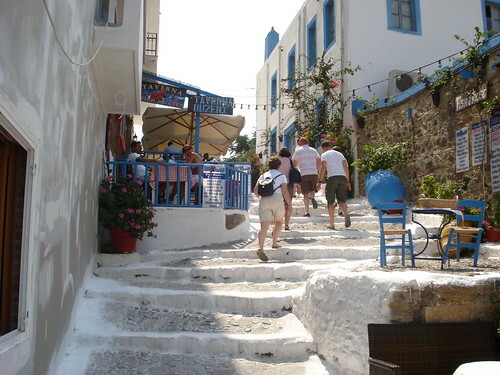 Kos is one of the quieter islands of the Dodecanese in Greece. From the end of October you will find it is cooler and if you wrap up warm it is lovely simply to ramble over the hills and explore the mountains – it will certainly be much warmer than Britain in the winter months. There are loads of cycle paths to follow and in the ‘off season’ these are pleasantly quiet. Visiting Greece from October to April is to see it almost at its best, with fewer visitors but still all of the flowers, colours and scents to enjoy. You might even encounter a peacock as you ramble around – they roam free on Kos. Although not all restaurants and bars are open on Kos in the wintertime there are still plenty to choose from and you can drift from pastry-shop to coffee-shop and enjoy the mild weather and blue skies. If you like to sight see, Kos has two of the most famous historical sites in Greece – the Hippocrates Plane Tree, and the Aescleplion, where Hippocrates taught medicine. From later in history, the walls of the castle of the Knights of St. John surround the main Kos Harbour, and in the centre of town there is the Casa Romana (the Roman Villa) and the ancient ruins of Kos. There are also several places for the children to play with bouncy castles and other attractions. Kos is a popular tourist destination but in the winter you will not find any direct flights in from outside Greece. You will need to fly to Athens airport first and then transfer. There are ferries from the mainland and other islands run by various companies; Blue Star Ferries, G&A Ferries and ANE Kalymnou. You can also get to Kos by using ferry services from Turkey, which are run by the Bodrum Ferryboat Association. Once there, it is easy to get around as there are buses, bike hire and car hire readily available. Specific church festivals mark the progress of winter on Kos. Ton Foton, the day of light, marks the 6th of January, the Epiphany. Many European countries make a lot more of the Feast of the Epiphany than in Britain, when it is usually just considered the end of the celebrations and is the day the Christmas decorations are taken down; Twelfth Night. Although the water is very cold in the harbour in January, the men of the town dive into the harbour to retrieve a cross thrown in by a priest; the successful diver will be blessed throughout the year. On the first day of Lent, the local people celebrate by flying kites and grilling octopus – this is the equivalent of Britain's Shrove Tuesday and is called ‘Clean Monday’. Carnivals mark the start of Lent – you should check the dates carefully because of course the Greek Orthodox Easter is different from the date in the Church of England. As you can see a trip to Greece even in the winter can be wonderful. It will be off season so you will typically find your accommodations and activities less expensive than a visit during the summer or high season. I also find visiting an area during the low season give you a better sense of life and culture there as well as a better interaction with locals. Thank you for sharing your thoughts. I really appreciate your efforts aand I am waiting for your next post thanks once again.